After I drew my play therapy / art therapy house, sun, tree, water, and animal assignment I kept the drawing out on a table so I could reflect on what I created. The first thing I noticed was that the house was rather large and off to one side of the page. It is a red –brown color with a red door. All of the windows have different colored curtains since the windows are to different rooms in the house. The roof is black and pointed. Since the house is supposed to be the individual, I feel that my house shows that I see myself as an important person. I know that my family depends on me and that I have a family that loves me. The difference in the colors on the curtains is because I see myself in many different ways. I like to joke and have fun, but I also know when to be serious and act more “grown-up”. I think the roof pointing up because I am an optimistic person. The house is grounded on a set of hills. I see this as life can be bumpy. But, being a grounded person, I can ride through the ups and downs of life. The tree is fairly close to the house in this picture. It is a summer tree fully in bloom, and has roots going into the ground. I feel very secure and happy in the relationships in my life. 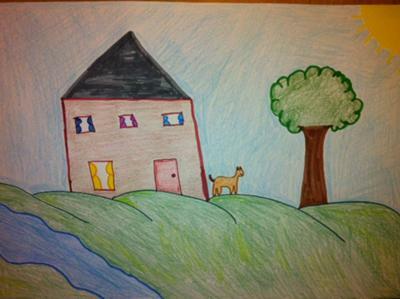 The animal I drew was a dog, which is very close to the house. I always had dogs as a child and had to have our dog of fourteen years put down a few months ago. When looking up the meaning of dogs, I read that happy dogs symbolize social activity. I am a social person, and lately I have not been having enough social activity as I am used to. Maybe the dog means I need to socialize more. The water is close to my house and is flowing like a small river. The water is wider where it is closer to the house and narrower as it is going away from the house. As a relation to my mother, I am close to my mother but she does live out of state. I see this as the direction the water is flowing in and how the shape of the water changes. The sun is far away, just as my father is. There are small beams of light shining down on the house. To me this is the small amount of time when my father was in my life when there were good memories with him. Overall, I found the play therapy / art therapy activity to be enjoyable and insightful. I also personally like doing this activity because I find coloring to be a relaxing activity. I can see how a child could express what is occurring in their life by doing this activity. The coloring is a great way for children to express themselves without feeling threatened. This would also be very helpful with children who have a hard time talking to others.